• Perfect strings for Rockabilly, Bluegrass, Psychobilly, Country/Western, and more! • Fits most 1/2, 5/8, 3/4, 7/8, and 4/4 scale basses. 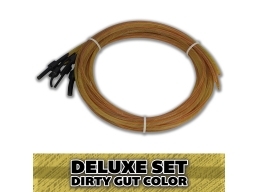 • 100% “synthetic gut” – nylon/Kevlar construction to simulate the tone and feel of natural gut strings. “Simulated “gut” texture on full length of strings. The strings have a light to medium-soft texture that has been “spiral cut” into the string. This slight texture facilitates better gripping of the strings for lightning fast pizzicato playing, and drag triplets with with almost no effort. The strings “grab” the air and force it to move, producing more mid and low end tone when playing acoustically. All of our nylon string sets come as a 6 string “bump” assortment (6 total strings of various gauge. See photos.) for 1/2, 3/4, and 4/4 size double bass. The idea is that some players prefer thinner, lower tension strings while others prefer thicker, higher tension stings. Why not offer a wide array of thickness and tension all in one package of strings? This is exactly what we do! Our string sets also include rubber dipped metal ends. NO KNOTS to come untied in the middle of your set! We are proud to be the only company offering this configuration. You need strings that sound great when played acoustic or amplified, strings that won’t tear your fingers up if you need to play 3 sets in one night, strings that stay in tune in hot/cold/humid/dry climates. You need Superior Bassworks Kevlar cored nylon strings for double bass. Perfect for Rockabilly, Psychobilly, Bluegrass, Country/Western,and much much more! The string sizes included in each pack are: .170, .155, .130, .105, .095, .080 (sizes in inches). If your bass has never had non-steel strings installed, please keep in mind that some modification of the tailpiece string slots, bridge string notches, nut string notches, and tuning machine string holes may be required. This is completely normal, and will not prevent you from switching to other string types in the future. Please measure your bass before ordering. If you are not confident making these adjustments yourself, please consult a professional luthier or more experienced bass player for assistance. These strings are not recommended for school orchestra students.